I photographed this beautiful wild caracal at Langklaas (Tall Nicholas) waterhole in the Kgalagadi, January 2018. It was an unusually confident cat and spent some time hunting near the base of a camel thorn tree. I photographed it for about an hour before it disappeared into deep undergrowth. Limited edition black and white prints are made with Epson archival carbon pigment inks and printed on 280gsm acid-free 100% cotton paper. Each print is signed, titled and numbered on the lower edge by Will Goodlet. To ensure the best quality, each limited edition print has a maximum permissible size specific to itself which depends on the conditions and equipment used during its capture. 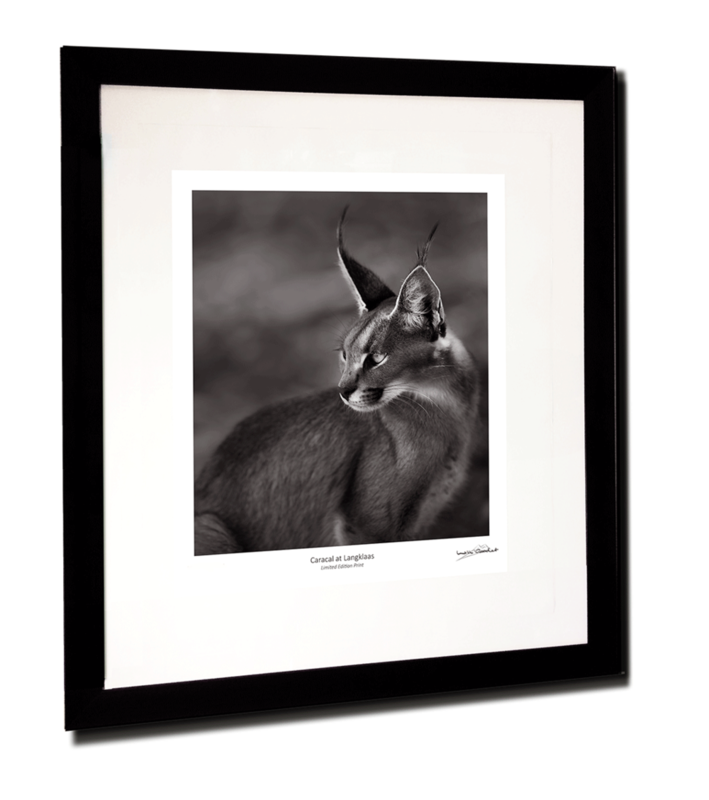 Caracal at Langklaas has maximum dimensions of 60cm x 50cm with an additional 4cm x 4cm x 4cm x 6cm white border all around to aid framing and signing. All prints can be made smaller than their maximum dimensions. Each limited edition print is accompanied by a certificate of authenticity signed and dated by Will Goodlet and is shipped in a plastic sleeve inside a durable tube. Shipping worldwide is at cost and is an additional charge. All prints are supplied unframed, which reduces shipping costs while allowing you to choose a frame to suit your hanging space and decor.